The focus of our preview is Warsteeds: LOTRO brings mounted combat! I had the chance to interview Aaron Campbell, senior producer on the Lord of the Rings Online team, about the newest features of the Riders of Rohan expansion. Set to be released on September 5th, the expansion entered Beta on Wednesday, July 18th. Our interview focused on the new mounted combat mechanic to be used by players while riding through the plains of Rohan. 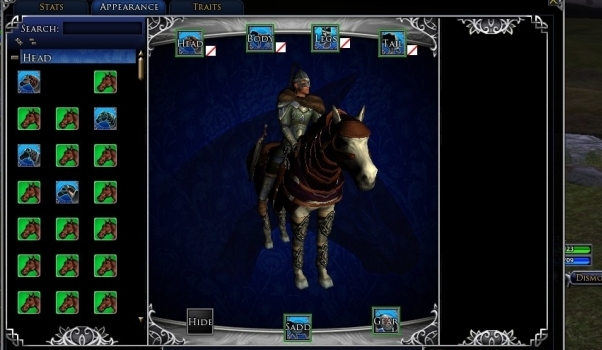 You can’t have a LOTRO Rohan expansion and not have Warsteeds. It’s like having Fangorn without Ents, or Mount Doom without Deus Ex Machina giant eagles. Aaron Campbell was more than happy to show ZAM that Rohan will not only feature many new mounts, but an entirely new mounted combat system as well! Players working through the quest lines in Rohan will receive their trusty Warsteed relatively early on in the expansion and we were lucky enough to receive a crash course in how it’ll work from the senior producer of LOTRO himself. My turn rate in the preview said “225,” but Aaron said the actual values are pretty meaningless as they will change throughout Beta. Under the mount image box was a pink box for a new legendary item: a bridle. “The bridle will have stats,; it helps improve your mount’s abilities and gives bonuses to your class abilities while mounted. And the effects will be customized to your play style while mounted.” The bridle itself will be another reward from the epic quest line. From the Stats tab, Aaron next directed us to the Appearances screen. “You’ll see we have a bunch in blue on the left side… those are baked and ready to go. By taking an icon and moving it to the appropriate slot you can really customize the appearance of your mount.” Many of the pieces are parts of larger sets, such as bone set or light elven armor set. Aaron noted that so far the most popular sets are those that look most realistic. “We have six slots and the horse’s hide or coat color, which is not yet implemented.” Most of the pieces will be earned by playing through Rohan content, or through reputations with the various factions in the expansion. From the appearance screen, Aaron filled us in on the actual mounted combat system. First, Warsteeds also earn experience, the same as the player. As the horses level they will unlock ability points that will increase proficiency on the third UI screen: ability trees. While a player will only have one Warsteed, the steed can be customized by putting points in the trees for light, medium, and heavy combat steeds. One primary consideration is the accumulation of fury: as your steed goes faster, attacks and healing gain a multiplier and are considerably more powerful. This means that a light steed able to turn and accelerate quickly will gain fury more easily than a heavy steed.